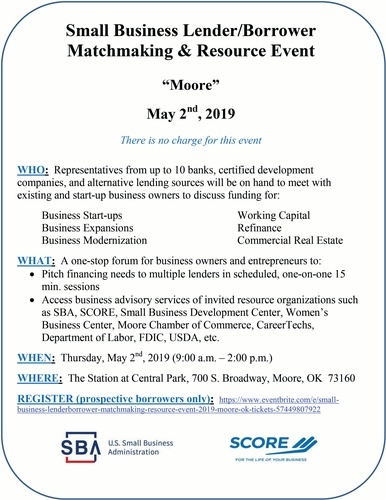 The Moore Chamber of Commerce and the City of Moore have worked together to bring the US Small Business Administration and SCORE's Small Business Lender/Borrower Matchmaking & Resource Event to Moore. Pitch financing needs to multiple lenders in scheduled, one-on-one 15 minutes sessions. Access business advisory services of invited resource organizations such as SBA, SCORE, Small Business Development Center, Women's Business Center, Moore Norman Technology Center, Moore Public Library and the Moore Chamber of Commerce.